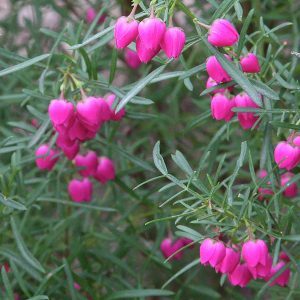 Boronia are a plant that many gardeners fall in love with. They are a group of small to medium sized shrubs, some with attractive perfume. Flowers are from yellow through to dark brown. The winter flowers and the perfume make a great addition to any sunny garden. They have a bit of a reputation of being a little ‘difficult’ to grow. However if you follow a few simple rules you will them to be a rewarding garden plant. They are varied, with low growing types such Boronia Nana, to tall species such as B. muelleri which can reach over 4 metres in height. All species have flowers that will open to reveal four petals, they have eight stamens and some species have good fragrance. Plants will generally reach around 1m in height. Flower colour ranges from white through to the browns and red as well as blue. All have fragrant foliage and many make great cut flowers. They are also grown for the essential oils that they produce, this is extracted from the foliage. Simply crush the foliage between your fingers and it will release the fragrance. Boronias also make excellent cut flowers. If should be stated that hey are not a naturally long lived, however this is their natural habit. So after a number of year, if they die back, it may simply be that their time is up. Simply replace them with new plants, they are fast growing and some are easier than others. The species that seem decidedly easier to grow than others are B. heterophylla and B. megastigma. These are the two that first time growers should look for. The real key to growing these wonderful plants successfully is position. They like sun, however not to much. They like a cool root run, however can’t abide with wet soils. This leads us to the position and the soil. They grow best in dappled shade, or morning sun and light afternoon shade. They do like a cool root run, so mulching will help. They require good drainage, so hill up the soil in wet areas. They will not tolerate very dry soils for long periods. So extra water in summer may be needed. They do prefer a cold winter to maximise flowering and do not like high humidity. Boronia grow well in cooler areas such as the Blue Mountains and the Dandenong Ranges. New grafted varieties of tend to more disease resistant and longer lasting. So although they are sometimes regarded as ‘difficult to grow’, they are in fact fairly easy in the right conditions. You can prune Boronias just after flowering. Pruning needs to be very light and not back into old wood. If you are looking for colourful flowers then the genus Boronia provide a group of plants well worth exploring. Both the species and the cultivars or hybrids. Probably the most fragrant species is B. megastigma, not the most fragrant plant in the world, however with good perfume. Look for the compact cultivars such as B. megastigma ‘Heaven Scent’ one of the easier varieties to grow. B.anemonifolius – The Sticky Boronia. B. coerulescens – The Blue Boronia. Grafted varieties are more disease resistant and longer lasting.